In his first public activity in Europe, His Holiness the 17th Karmapa addressed a press conference this morning in Frankfurt, followed by a brief meeting with members of the local Tibetan community. At an event hosted by Tibethaus Deutschland under the patronage of the 14th Dalai Lama, the Karmapa spoke to a room full of members of the German and international press. He expressed his delight at having arrived in Europe for his first trip, and fielded questions on climate change, the future of Tibetan culture, ordination of women in Tibetan Buddhism and other spiritual questions. Puntsok Tsering, Managing Director of Tibethaus offered an initial welcome, while Ringu Tulku Rinpoche, a highly respected lama who is also the head of Karmapa Foundation Europe, introduced His Holiness and later provided the English translation. He observed that, “especially since the Industrial Revolution, people have developed a mentality that assumes that happiness is totally dependent on material progress. A way of life based on consumerism and materialism developed, and therefore people’s greed increased.” He called for people to reassess this assumption, and to work on inner development, cultivating compassion as their central motivation in working for climate change. Frankfurt is home to a local community of Tibetans, who arrived at Tibethaus in hopes of seeing the Karmapa. Following the interaction with the press, the 17th Karmapa was joined by a group of Tibetans living in Germany. 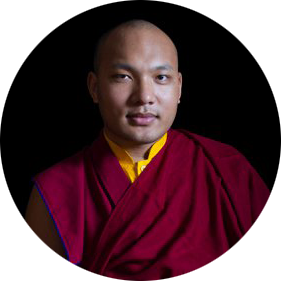 Noting a substantial number of children among them, the Gyalwang Karmapa acknowledged that many of the Tibetan families in Europe have two working parents, and so have many demands on their time and attention. Nevertheless, he stressed the importance of making it a priority to provide their children with an education in Tibetan language. He closed by expressing his hope to be able to return to Europe many times in the future, and so to meet them again and again.